Phenobook is an open source tool for field data collection. It allows researchers to record observations (including photos) in an organized way. Research groups can manage phenobooks by specifying their data structure and granting permissions to collaborators. It consists in two main modules: A server application (in php) and a mobile application (in Apache Cordova). 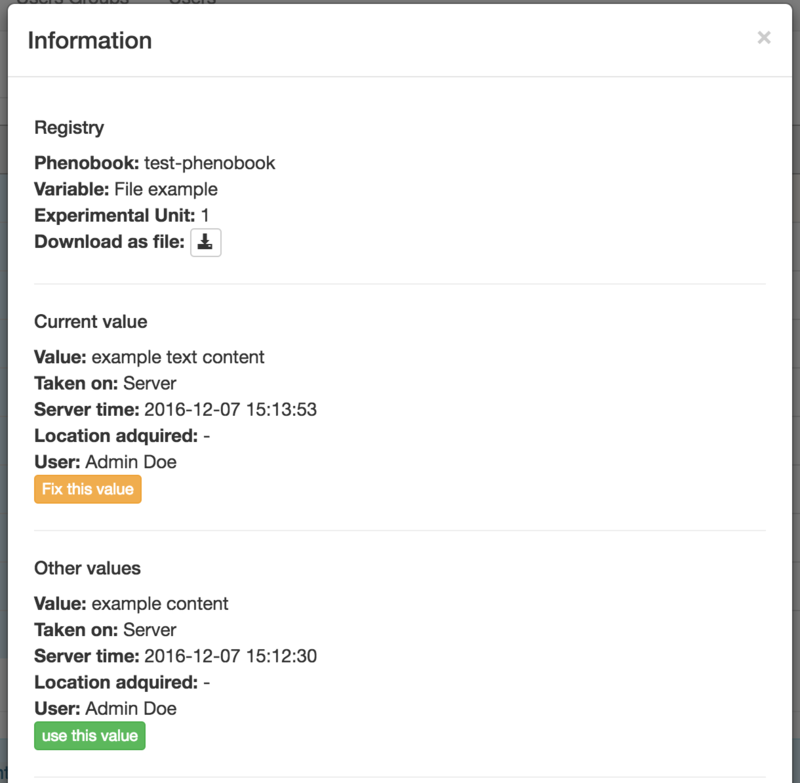 In the server module, phenobooks are created and maintained, and in the mobile application, observations can be registered offline and syncronized later with the server. Each Phenobook is a spreadsheet like document and each column is represented by a variable. Variables are created before creating a Phenobook, so different Phenobooks may share the same variables. This way it is possible to merge different Phenobooks results in the same report. To create variables, select the option Variables in upper menu. Click on Add button and insert the desired variable name, description, field type and whether the variable is informative. Field type can be: Text, number, boolean, date, categorical and photo. If a variable is selected as informative, it means that the data is known prior to make the observations. 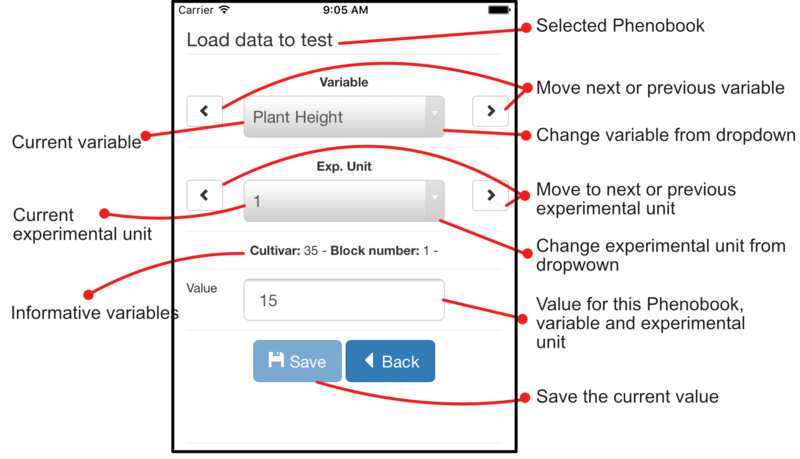 This will serve as a guide to the user when registering records (for example in a crop experiment, cultivar and repetition can be both informative variables, with field type categorical and numerical respectively). Your can use your own standardized vocabulary for experimental variables here. Observations can be registered from the Server application. This table allows to copy and paste from / to MS Excel, OpenOffice Calc and similar spreadsheet software. Information is automatically saved when changed, excepting the case when cell has a format error (ie. alfabetic characters in a numberic variable). In this case the cells are highlighted in red. By clicking in this option, the Phenobook data is exported to CSV (comma separated file) and can be opened by any spreadsheet program. Allows the edition of the Phenobook information. It is possible to merge different Phenobooks data by accessing this option in the top menu. First you need to select which Variables you want to be shown. Once selected them, you can select as many Phenobooks as you want. It is possible to show the results or download a CSV file. In the results table, you can access record information by clicking on each cell, also a summary is provided when clicking on each variable name. A user can be non-administrator, administrator (can manage users within its user group) and super-administrator (can manage user groups). Users are organized in User Groups. This structure allows one single installation of Phenobook Server work for large organizations where multiple working groups work separately. Phenobooks are only visible for users that belong to the same User Group that the user that created it. In order to add or edit Users Groups you can access the option with the same name in the top menu (if you are a super-administrator). When adding new users, besides personal and access information and check whether the user is administrator. The user is automatically linked to the User Group the creator belongs to. For Android devices, you can download the official application from Google Play Store here, or download the APK file here. For Iphone users, you can go to the app store link here. If you are using a custom server, it is important to indicate its address in the settings button. Otherwise Phenobook Mobile will try to connect to a different server. Mobile application is developed in Apache Cordova, compiling for plenty devices can be done by following this documentation. Apache Cordova and its dependencies as required for development of the mobile application. Installation is described here. Phenobook Mobile is created to save observations offline and syncronizing when a connection is available. First time you open the application, it is required to make an initial update, for this you need to enter a valid username and password. Existing Phenobooks will be downloaded and accessible on the application once the user log in. You can take observations by simply selecting the Phenobook name and clicking Load data button. You can change the variable and experimental unit from the top selectors and put the value in the bottom field. The value is saved automatically if the variable or experimental unit is changed. If you want to see a results table, you can press the See table button. It is required to enter log in credentiales before updating. By clicking the Update button in the main screen, records locally saved are sent to the server and records taken by others are downloaded to the application. Phenobook Variables api/export-phenobooksVariables.php user, pass Will return an associative array of phenobooks and its variables. Registries api/export-registries.php user, pass, phenobook (optional, the phenobook id), variable (optional, the variable id), experimental_unit (optional, the experimental unit number). Will return all registries by default. It is possible to specify phenobook, variable or experimental unit. Import registry api/import-registry.php user, pass, experimental_unit, variable_id, phenobook_id, value Will save value as a new record in specified phenobook, variable and experimental unit. You need a server that runs a web server (we are using Apache), MySQL and PHP 5. Once you have your database created, put your credentials in the configuration file (files/php/config/config.php). An initial database dump is provided in database.sql (remember to delete this file before uploading to the server). All initial configuration is set here, as well as an admin user (login: admin@admin.com and password: admin) and a default user group. It is important to change the main administrator user password.